Prefabricated crowns made of tin-silver alloy for short-term adult posterior use. 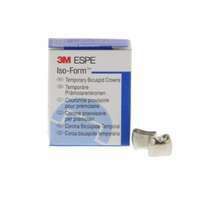 Faster placement than acrylics and chemical resin for single units for a quicker procedure. Crown Starter Kit is packaged in a unique, stackable tray that provides convenient, easy storage of prefabricated crowns. • Bicuspid and molar crown selection to cover adult posterior applications.